- Route 33 - US Route 33 ends at the intersection of Broad and Harrison Streets and begins SR 33 eastward. I would generally install beginning and ending signs in both directions at that point. I would advise the city to use the proper shield for all signs east of Harrison Street. - Route 250 - This route begins and ends at 18th and Broad. These start/end points are generally used for maintenance payments, but have little value to the public. The email also mentions that inconsistencies with directional banners on VA 147 will be fixed (VA 147 is an east-west route that is also signed north-south in random places in Richmond), and that an erroneous VA 197 shield east of US 1/301 will be removed, because this segment is not part of VA 197. The email also states these issues will be fixed in the next 90 days. I think this might also bring an end to any debate over where US 33 and US 250 end, as the city consulted VDOT records for this information. US 33 ends at the intersection of US 250 (Broad Street) and Harrison Street (VA 33). This sort of makes the US 33-250 multiplex in Richmond useless, but not quite. US 250 ends at 18th and Broad. 18th Street is US 360. Originally posted in general Virginia thread. US 33/VA 33 End Point and US 250 in VA topics also merged as they are really just one combined oddity. Its about time someone debunked their ends! I remember driving around Richmond in 1999 looking for those when my check oil light came on! I had to forego looking for them and continued on my way, putting oil in the car at Ashland, and making it to my destination without ever figuring the ends out. When signs go up, I'll take photos of them so I can send them to both you and Froggie. It actually took three tries for me to get a response from DPW; I guess former Mayor Wilder wasn't interested at the time, and now that Richmond has a new mayor, they're more interested in getting this stuff fixed. I've always preferred the idea of just having US 33 end at US 250, even though having a 2di US highway end at a 3di US highway might seem a bit awkward. The US 33/250 duplex is pretty pointless as it is. Well I'm fine with it ending at US 1/US 301 as long as there's a "to VA 33" sign going east on US 33/US 250(I meant pointing north along with US 1/US 301 if I stated that wrong). 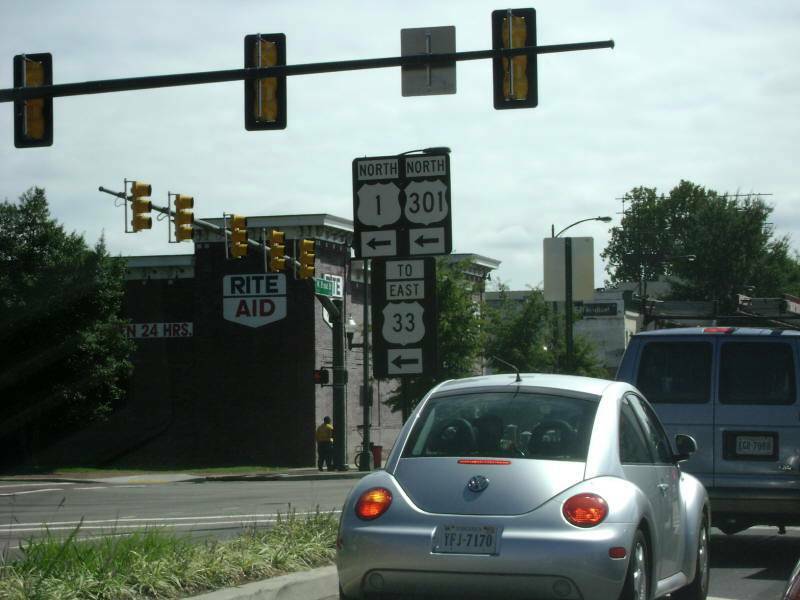 There is an erroneous "TO US 33" sign at the intersection of Broad and Belvidere (US 1/301) pointing toward Leigh Street, which is VA 33. That US 250 shield has been there since at least 2002 (it was there before RAMZ Hall got built, which was in 2004, and it was there when I originally started at VCU in 2002). I think there's a 2001 decal on the back of it, but I don't remember. US 33/250 were signed a lot better in 2002-2004 until Richmond decided to replace all the traffic signals on Broad between Laurel and Lombardy; this removed a few old uni-signs. The other sign is a remnant from when US 33 was routed on Broad east of US 1/301 nearly 30 years ago. There's also a very old US 250 reassurance marker a couple blocks east of here. Incidentally, there's an erroneous US 250 shield on Marshall Street, close to where this sign is. It doesn't say "to" and isn't a trailblazer; US 250 has never been on that part (or any part) of Marshall. I was in Richmond again yesterday, there is also a new erroneous US 33 shield on westbound Leigh Street at N. Adams Street/Chamberlayne Pkwy. It's not a trailblazer, it just says "US 33 West". Yet, on the opposite side of the same street is a "VA 33 East" shield. Can anyone state with definitive certainty where the end of US 250 in Richmond is located? "The U.S. Highway passes to the north of Richmond's historic Main Street Station, then reaches its eastern terminus at US 360, which heads south along 17th Street and north on 18th Street. Broad Street continues east as an unnumbered city street through the city's Church Hill neighborhood." VDOT apparently cut it back in 2003 to Broad at 18th (US 360), from Broad at 23rd (old US 60). Doesn't look like there are any useful signs. If you still want to see it, your best bet is probably exit 74B. Aside: where the hell are the attachments referenced in http://www.ctb.virginia.gov/resources/ctb-minutes-09172003.pdf ? Per emails with VDOT and the City of Richmond, US 250 definitively ends at US 360. The terminus is unposted, though, and signage from I-95 is actually partially erroneous (US 33 isn't on this part of Broad). Concur with NE2...exit at 74B, then loop around to 18th and Broad. The Clinched Highway Mapping project has the east end of 360 at 21st and Broad. I was there yesterday, no "end" signage at that intersection either. Anyway, just to be sure you might want to go the extra two or three blocks, and turn around at 21st. The Clinched Highway Mapping project has the east end of 360 at 21st and Broad. That's because I haven't fixed it yet. And given that I'm a bit overextended at the moment, I've considered giving Virginia over to you or Mike Roberson. Hey, speaking of US/VA route numbers. What exactly happens to US 33/VA 33? Do they terminate at the same point? I've been US 33 from Harrisonburg to I-295 and VA 33 from I-64 to Stingray Point, and was curious. Yes. US 33 in downtown Richmond turns north off of Broad Street on Hancock Street and ends at Leigh Street. VA 33 starts there and uses Leigh Street east to the Mechanicsville Turnpike and Fairmount Avenue. why the designation change? why not call it US-33 the whole way? I thought US 33 and US 250 continued together once they joined, to both terminate at US 360. Looking at the VADOT traffic counts database, there is an anomaly in the US 33 entries. It appears that the data base has the segment of VA 33 along Hancock Street from Broad Street to Leigh Street entered as US 33. It also has US 33 continuing along Broad Street to US 360. It also has a directional pairing of VA 33 along Leigh Street and Harrison Avenue to Broad Street. This would pair with the Hancock segment labelled US 33. It looks like US 33 and VA 33 do meet at the Broad Street and the Harrison/Hancock intersections. US 33 runs east/west on Broad Street, while VA 33 runs north on the Harrison/Hancock street pairing. This was true from 1974-81. There was a short period (Sept-Dec 1981) where technically US 33 did not turn into VA 33. VA 33 was rerouted first, onto the new MLK Jr Bridge to run back into US 33 at Harrison/Hancock. Thus US 33 continued past VA 33 for a time. In Dec 1981, US 33 was explicitly removed from Broad St between Hancock/Harrison and 17th. Therefore, US 33 ends today at Broad and Hancock/Harrison. The confusion stems from the fact that Richmond originally posted Hancock/Harrison and Leigh as US 33 over to the MLK Jr Bridge instead of VA 33. There are more VA 33 signs now, especially around US 1-301. Traffic Logs also contribute to the confusion. I asked because when I was coming home from Deltaville with my parents (they had a sailboat on the Chesapeake) I'd see signs for Harrisonburg on VA 33 and was always curious since there are no signs for VA 33 on I-95, just US 33. As long as US 33 doesn't veer off Broad Street, then I'm happy. I still have both US 33 and US 250 clinched in Virginia and don't have to worry about going back sometime and driving one or two city blocks worth of streets to get US 33. 2011 shapefiles verify what Mike said about the route log...that the "changeover" happens at Broad and Harrison.